As part of developing my sourdough bread baking skills I wanted to try to find a local source of high quality, fresh wheat flour that was as unaltered as possible. Last fall my Dad was in the hospital in London, Ontario and Chris and I drove there to see him from Toronto. During the drive we passed by the historic Arva Flour Mill and I was reminded about how my mom used to get me spelt flour from there when I was experimenting with a wheat free diet for my asthma. Being that it was Sunday and the mill was closed, I made a mental note to look them up online to see if they happened to have an online store. The Arva Flour Mill is Canada’s oldest continuously operating water powered mill, and it is owned and operated by a dedicated group of people who see the value in preserving Canadian heritage and in supporting locally produced food products. While I have not yet ever visited their store, I hope to make it there sometime soon. They do have an online store, but so far they are stocking only selected flours there. Hopefully more products will be available there soon — you can see by watching their video that they carry a wide range of milled products, beans, pasta and other dry goods, and have plans to bring in locally produced cheese and meat products. After discovering their online store I ordered what I think is an excellent deal — their 6 bags of flour for $60 with free shipping to Ontario and Quebec (given that 6 bags totals 15 kg you cannot beat the free shipping deal). You can mix and match from three flours — hard whole wheat and hard unbleached white, as well as their Imperial unbleached pastry flour. So far I’ve baked bread and other goodies with the whole wheat and the white flour but I have yet to try baking with the pastry flour. I think however I’ll give it a try on my next pie. What is “hard” flour you ask? It means the flour has a high gluten content, in the 12% to 14% range, and it generally produces a dough that is very elastic and holds its shape well. It’s typically used for bread baking vs. other types of baking. 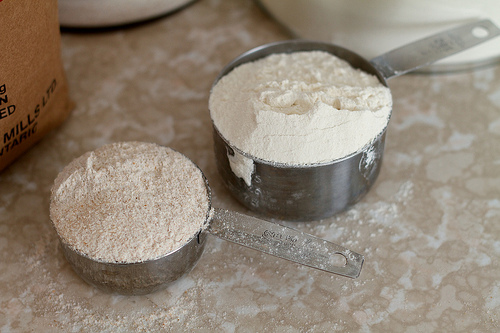 I’m not really a flour expert per se, but given that this flour is milled fresh and does not go through enrichment or other processing techniques, and then shipped directly, it is a more wholesome product than what you find on grocery store shelves. The flours you buy from your average grocery store are going to be highly processed, highly bleached for “whiteness” and probably have a reduced gluten content. These techniques give the product a much longer shelf life to avoid rancidness. I also recently discovered that some of their flours are also available at the store at Evergreen Brickworks, which just so happens to be right around the corner from where our new house is. So if you dont feel you want to order a huge amount of flour online you can find this product in Toronto too. I haven’t noticed a huge difference in how the hard flour behaves in my regular baking but with my sourdough I have noticed that the dough rises much more significantly in the overnight final rise stage than it did using regular all-purpose store bought flour. And I think the flavour of the bread is greatly improved too. I do have to add a caveat though. My mom called me last weekend totally perplexed and asking for advice. She has been using Arva flour for the last couple months as well — my dad has some gastro-intestinal issues that mean he cannot eat store bought bread so she makes it at home, and she wanted to use unbleached flour as well, and since she lives much closer to Arva than I do, she was getting flour there. She uses a bread machine to make her dough and then allows it to rise outside the machine and bakes it in the oven. But over the last few weeks her bread results were complete letdowns — and she had tried switching out all her ingredients (except the flour) to try to figure out where the problem lay. She just kept getting hard little lumps of dough that wouldn’t rise. Normally she has problems with her bread rising almost too much. I figured her problem lay either with the bread maker (odd since she didn’t bake the bread in it anyway — its essentially being used as a fancy mixing/kneading tool), or the flour. So I suggested switching out the flour to see if that helped and voila — it did. 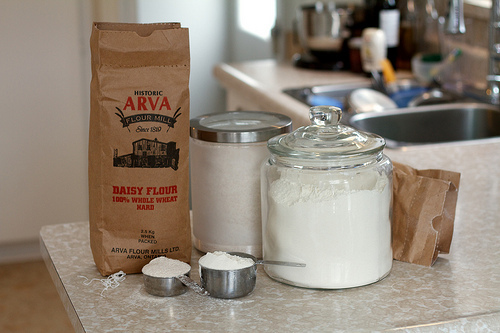 So we can’t explain why her Arva flour went from working just fine to suddenly not, but that was her recent experience. Regardless, I have very much been enjoying this product and it makes me feel really good to do my part in helping this beautiful piece of our local, agricultural heritage alive. I can’t wait to visit the mill in person and load up on some of their other products. Chris has been encouraging me to make a rye sourdough like his Oma used to make, but it’s not easy to find really fresh rye flour, so I hope to either pick some up myself or get my mom to load up on it next time she’s there. Next Post I don’t know what to put here. A couple of years ago in Oregon, we happened upon (OK–I found it in one of those glossy local magazines at a motel, which are typically full of shopping and hot air balloons and wine tours) a water-powered mill. The Butte Creek Mill. We got the best.tour.ever, and bought a ton of their milled stuff, as opposed to the stuff they don’t mill but just package up. And then drove it 800 miles home. I wish we had a similar place a little closer! Hi There, You should check out Jeffrey Hamelman’s book called Bread- A Baker’s Book of Techniques and Recipes. It is a standard reference book for professional bakers written by an amazing man (and baker). 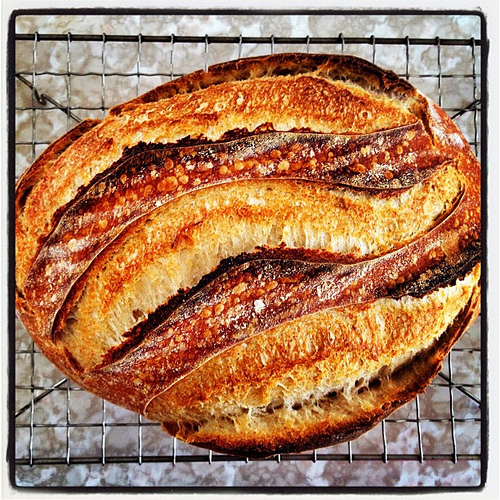 Zero pretence and great insight into sourdough baking. Lots of inspiring personal reflections from Jeffrey through each chapter as well!